1 x female performer with a playing age of 65+. 1 x female performer with a playing age of 50 – 65. 1 x actor/joker (male or female) with substantial experience of forum theatre facilitation. All performers are required to play a variety of characters and will have adeptness for regional accents. All performers will need to have excellent improvisation skills as well as experience of or an understanding of interactive theatre. Performances will take place during the hours of 10am – 3pm. From the 20thJanuary until the 28thMarch there will be a total of 14 x performances in Liverpool and the Midlands. Venues are the Museum of Liverpool and a key Midlands cultural venue (actual venue tbc). The 4-week rehearsal is offered on an ITC/Equity contract at £430 p/w. Fees for the 14 performances are offered on a freelance contract basis at a rate of £150 per performance. Expenses for relocation can be negotiated. Auditions will take place in Liverpool on 13thNovember 2013. 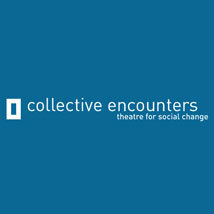 To apply please send your CV and headshot to vacancies@collective-encounters.org.uk by Monday 11th November. For more information call 07811175095.